Virginia’s first newspapers… and much more. If there is nothing as fragile as news, the fragility of newspapers themselves runs a close second. Hundreds of newspapers have begun with great ambition, only to merge with others or fold from bankruptcy. With that knowledge, William Parks might be the most astonished person of all to learn that his “Virginia Gazette” survives intact nearly 270 years after he published the first four-page edition on Aug. 6, 1736. Newspapers were a long time coming to colonial Virginia. English law precluded any printing by the colonists for years after Jamestown was founded in 1607. The royal governors did not allow any printing until 1690, and even then printers were governed by royal instructions which required a license and the governor’s permission. An enterprising fellow tried anyway. In 1682, a printer named William Nuthead arrived at Jamestown, then the capital. He set up his press and began to publish the acts of the recently adjourned Assembly. He also printed several other papers about which nothing is known. With that definitive ruling, Nuthead packed up and returned to his native Maryland. Printing was nonexistent in the colony for nearly 50 years thereafter. Government policy eventually eased and a more tolerant attitude prevailed. In 1730 William Parks moved from Annapolis to Virginia’s new capital, Williamsburg, to open a branch office. Parks had only three years earlier founded Maryland’s first newspaper, “The Maryland Gazette”. Parks was an eminent printer. Before arriving in Maryland he operated printing shops in three locations of his native England – Ludlow, Hereford and Reading. Parks had an effect on Williamsburg. Right from the start his Gazette had the professional touch of a master craftsman. News in the Gazette was taken largely from letters written abroad and recently arrived in the hands of the printer himself or friendly readers. Information was also taken from English papers and other colonial sheets. There was not much local news in Parks’ Gazette. What little there was appeared primarily in advertisements of recent ship arrivals, shops opening, runaway slaves, deserted spouses, and strayed horses. By today’s standards The Virginia Gazette of 1736 would look gray and ponderous. There were no headlines, no photographs, no fancy page makeup. But there was news, and for a town that never had a newspaper before it was welcome. A typical day for William Parks had him working ten hours, perhaps more if he was printing his weekly Gazette on his sheet-fed handpress. It was a laborious process of setting the type by hand, picking letter by letter from a box of matrices. Once the type was set it was locked into place in a metal form. The type was inked and paper was laid across. The form was rolled into the press, where the pressman “pulled” an impression by yanking with both arms the big handle of the press. This pressure forced the press to screw down on the paper and imprint the type on the paper sheet. Around 200 sheets an hour were printed this way, then hung to let the ink dry. Hours were dictated largely by daylight, although some type was composed by candlelight. This led to errors and an occasional mishap in which trays of painstakingly set type were “pied” or spilled. Colonial printers were hampered by a scarcity of type that slowed the printing of books because only a few pages could be set at a time before the letters were reused. Weather frustrated many a printer, Parks included. Winter cold slowed the mails on which the Gazette was so dependent for news. When no dispatches arrived, Parks would offer that as an excuse for printing a shorter sheet. Spring and fall were the busy time during which the General Court convened in Williamsburg. Summer and winter were comparatively dull, and this is reflected in the Gazettes of the period. Censorship also posed problems, and from three sectors: the English government, local authorities, and an offended public. The last major problem faced by colonial printers was a shortage of paper. This was handmade stuff, consisting of ground-up rags. It was tough and durable but varied in quality. In 1743 at the urging of Benjamin Franklin, Parks set about building his own paper mill in Williamsburg. Over the next four years Franklin sold Parks 11,382 pounds of rags. Appeals were often printed asking readers to save their old clothes for paper-making purposes. Old shirts, caps, dresses, handkerchiefs and gowns were brought and subsequently returned to the reader in a different form. In early 1750 Parks sailed for England on a business trip. During the voyage he was seized with a fatal attack of pleurisy and was buried at journey’s end in Gosport, England. First public printer in Virginia. First publications of literary works in Virginia. First paper mill south of Pennsylvania. Following the death of William Parks in 1750, his associate in business, William Hunter, bought the printing shop and with it the Gazette. Hunter went on to distinguish himself in the tradition of William Parks. He served jointly with Benjamin Franklin as deputy postmaster general for all the colonies. He also printed in 1754 the first published writings of George Washington, “The Journal of Major George Washington,” who at the time was 22 years old. If there ever was a heyday for newspapers in Virginia and Williamsburg, it was during the Revolution. Albeit partisan, The Virginia Gazette and other colonial newspapers reported well the news of the growing unrest between the Crown and the colonies. Fully 10 years before the Declaration of Independence, there appeared carefully worded accounts. The repeal of the Stamp Act in March 1776 brought great rejoicing to the colonies and was covered locally in The Virginia Gazette on June 20, 1776. Hunter died in 1761 and was succeeded by another brother-in-law, Joseph Royle. Hunter’s will stipulated that Royle manage the business for himself and Hunter’s infant son, William Hunter Jr.
Rind was elected public printer by the House of Burgesses, giving him an economic foothold in the form of printing documents and laws. As it turned out, the Assembly three years later spread the wealth to both Gazettes when it ordered them to print a large volume of the Acts of Assembly then in force. Alexander Purdie succeeded Joseph Royle as publisher of the original Virginia Gazette. In 1767, Purdie took into the business John Dixon, who by marriage was related to Royle’s widow. Purdie, dissatisfied with the partnership, withdrew to set up his own Virginia Gazette. 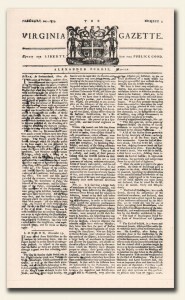 The first issue appeared Feb. 3, 1775. If the reader is confused, imagine how confused Williamsburg readers were 200 years ago. By early 1775 there were three separate Virginia Gazettes, all operating in town and all under the same name. Nor were these three the only Virginia Gazettes. By 1809 a total of 24 papers in the state had used the term Virginia Gazette in their flags. The reason is simple. “Gazette” in Britain specified “official record” and lent real authority to any periodical with that name. In the colonies, the Assemblies ordered their resolutions and proclamations printed “in the Gazette” or “in The Virginia Gazette” for public attention and consumption. But it was not specified which Gazette was to get the business, leaving it up for grabs in Williamsburg among three papers. A printer calling his paper, say, The Williamsburg Bugle, was automatically eliminating himself from any government income. Rind’s paper was taken over upon his death in 1773 by his wife, Clementina. She thus became the first woman printer and editor in Virginia, and is credited by at least one historian as one of the 10 pioneer women journalists in America. By 1775 John Pinkney took over as manager and then in 1776 as owner of Mrs. Rind’s shop and paper, but he moved to North Carolina early in 1777 and died in August that year. This marked the end of the second Virginia Gazette. The third Gazette operated by Alexander Purdie continued after his death in 1779. His nephew, John Clarckson, and one of his printers, Augustine Davis, ran it until the end of 1780 when it ceased operations because the capital had moved. Purdie’s Gazette continued to be a sparkling newspaper after it was formed anew in 1775 and Dixon was left with the original Gazette. Perhaps because Dixon’s new partner, William Hunter Jr., was a loyalist, the original Gazette dragged its feet on covering the Revolution. In any event, Purdie continually scooped the other two Gazettes. On Feb. 2, 1776, Purdie printed excerpts from Tom Paine’s pamphlet, “Common Sense,” the famous statement of arguments for independence. John Pinkney ran it the next day in his Virginia Gazette. The following Friday, July 19, Purdie ran key passages from the Declaration, promising to print the entire document next week. 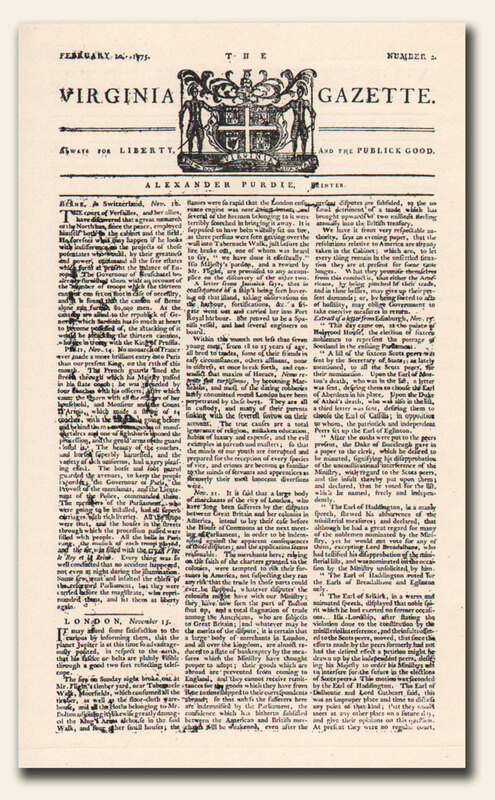 Dixon and Hunter followed suit and the two Gazettes ware thought to be the first papers outside Philadelphia to print the Declaration verbatim. What’s curious is how the two Gazettes played it up – or down. Purdie ran it as lead story on Page 1, which it consumed entirely before concluding atop page 2. There were also reports on the proclamation of the Declaration in Trenton, New York and Williamsburg. No one knew during these troubled times what the outcome of the Revolution would be. But the Gazettes and the other 34 colonial newspapers reported the excesses of the British government and the steps taken by the colonists to guarantee their own freedoms. More than the political pamphlet and more than the sermons by political clergy, the colonial newspaper contributed the most to the propaganda of the Revolution. The Patriot press inspired the colonies to rebel against tyranny, and it worked.